After 2012's Amazing Spider-Man tie-in game presented some interesting ideas, I was really hoping that Beenox would have an opportunity to take the things they'd learned and apply them to a new, stand-alone Spider-Man game that would not be constrained to the plot and release schedule of a film tie-in. Sadly, that hasn't happened yet, and we have a new movie tie-in game that suffers from almost all of the problems associated with a movie tie-in. Once again, Beenox was smart enough to know better than to follow along with the movie's asinine plot and opted to write their own side-story. Unfortunately, this one isn't as well written or as well presented as the previous game. It could have been a good story, but plot is clumsily-executed, and the associations to the movie only drag it down further. The Kingpin is comically (and ridiculously) oversized. 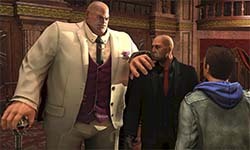 The bulk of the story is based around Wilson Fisk (the Kingpin) using rising crime rates as an excuse to deploy his private anti-crime task force in New York city. 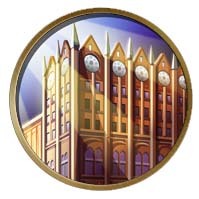 His company partners with Oscorp (who supplies the task force with its tech), and sells the task force to the public as a way of stopping crime and ending the vigilante justice that has plagued the city. But secretly, the task force is really out to destroy rival crime bosses and give Kingpin a monopoly on New York's organized crime underworld. There's another secondary plot about hunting down the serial killer Cletus Kasady, who is killing criminals. This plot is only barely tied to the Kingpin thread, but it takes center stage during a large chunk of the second act of the game, and almost seems to become the main story - almost as if the writers couldn't decide if they wanted the game to be about Kingpin or about Carnage. 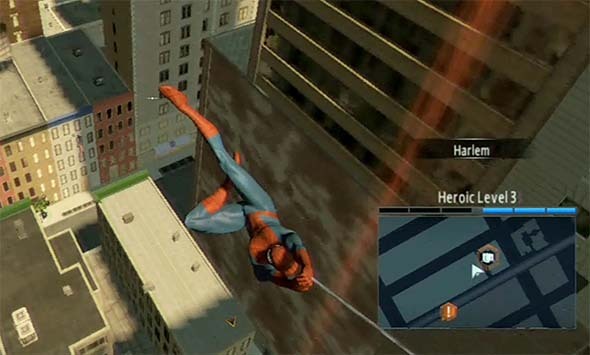 Web-swinging uses pseudo-physics that requires more active involvement from the player. It's more rewarding than the prevoius game, but still not up to the level of earlier Spider-Man games. 'Dark Souls: Artorias of the Abyss' DLC offers more "Jolly Cooperation" and "Jolly PvP"! I may have been a bit hard on Dark Souls in my original review (despite spending like six months playing it before I reviewed it). I guess - despite my best efforts - I just couldn't get over my love for Demon's Souls (which I still think was a better game for its time). But Dark Souls ended up eating up a lot of my time, and I have fallen as much in love with it as I had for Demon's Souls. As such, I have updated my original review with a new, retrospective score to go along with this DLC review. I bought and downloaded Artorias of the Abyss DLC on day one (PSN) when it was released last year, but didn't get around to playing it until earlier this year. Instead of just unlocking a special quest as soon as the DLC is download (ala Skyrim), the DLC of Dark Souls can only be accessed by defeating an existing, but entirely optional boss in an existing, but entirely optional area of the world; then defeating an existing enemy that allows access to a specific NPC; then defeating another monster in one of the end-game areas (after acquiring the Lordvessel) in order to unlock the "key" to the DLC content. Phew. That's a lot of hoops to jump through! So it took me a while just to be able to access the new content - let alone play through it. Sure, you may have paid for this DLC, but FROMSOFTWARE is still gonna make you work for it; and kudos to them for not compromising on their principles! 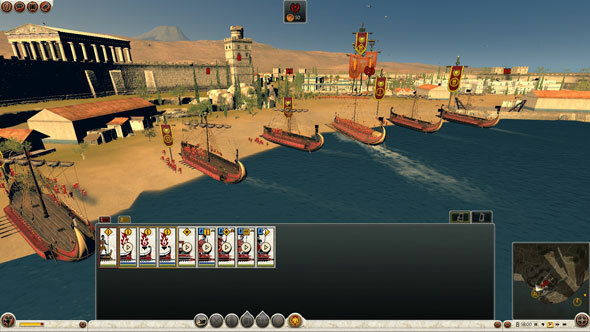 I had high expectations for Total War: Rome II. Shogun 2 is one of my favorite games of the recent years, and its second expansion Fall of the Samurai made it even better! Total War is one of the few game franchises that has managed to keep itself outside of the grasp of the casual-gaming market, and has time after time provided some of the deepest, and most engaging strategy games available. But it was only a matter of time before Sega and Creative Assembly began to treat their flagship franchise as a mainstream release rather than a niche title, and they chose to begin with Rome II. The result is a series of questionable changes to the way the game is played, a dumbing-down of the overall interface, a gutting of features, and a host of bugs and balance issues in a game that feels more like a paid-for beta than a full release. Creative Assembly has been tweaking the game with patches every one or two weeks since release trying to bring the game up to par, so it's in a state of constant flux as major balance tweaks, mechanic changes, and even new feature sets are being introduced. As such, I don't feel it's appropriate to fully review the game quite yet, and I will treat the release version more like a public (paid for) beta. Hopefully, the game will see marked improvement, and it will not end up like disastrous SimCity "reboot". I also wrote an impressions post about that game, but never got around to a full review because the game never became worth playing. The most immediately noticeable area in which depth and control have been lost is in the interface. I'm not going to complain too much about the campaign interface, since it still has most of the information that you would expect. Provinces are divided up into regions, and each region contains a settlement, but the province interface allows you to manage all the settlements in the province. This is a little bit of streamlining that makes sense. You don't have to manually click on every little settlement in order to give build orders or view public order. The only downside is that this system has minimized the role of resources. You don't build specific structures on improvements (such as mines or pastures). Instead, this is all apparently handled by the cities, which would be fine, except that now enemy armies can't pillage your resources directly. Instead, a more abstract "raid" order has been tacked on to armies that lets them automatically pillage resources in the province. One of my biggest criticisms with the Gods & Kings expansion pack for Civilization V was that none of the features added really felt all that fresh. They were just redesigns of old features that were present in previous games. Granted, they were also the most highly-requested features by the player community, but as concepts, nothing really felt new or original. The new expansion, Brave New World changes all of that by adding never-before-seen concepts to the game, and they add a great deal of flavor and dramatically change the way that the game unfolds. Trade routes are an obfuscated combination of physical units and abstract "lines on a map"
Venice: the first playable City State! 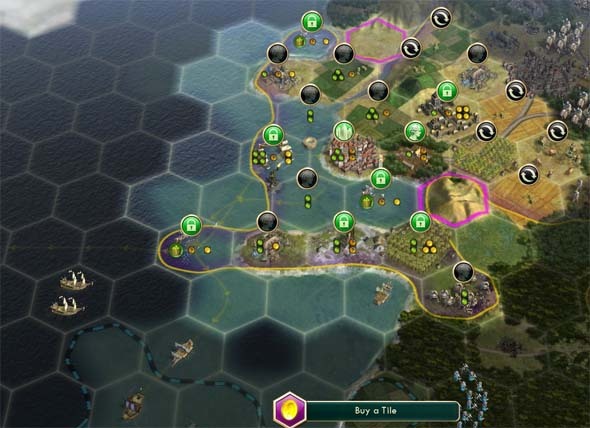 I have long been asking for the introduction of some kind of international trade route mechanic to be added to Civ V. Without such a feature, the vanilla game (and Gods & Kings) were missing one of the key incentives to maintain peaceful relations with your neighbors. Well now we have such a feature. In some ways, it's a step forward from Civ IV's completely non-interactive trade routes, but it's also a bit clumsy. Coastal cities might seem weaker due to the lack of gold on sea resources, but sea trade routes are more profitable and have longer range than ground routes, so coastal cities are still valuable.